Connect to a telephone interpreter covering over 170 languages in seconds 24/7. No pre-booking required. Telephone interpreting is simply consecutive interpreting over the phone instead of face to face. It’s the ideal solution when geographically dispersed people need to talk but do not share a common language. We call our telephone interpretation service LanguageBridge. We’ll give you a telephone number to dial into our LanguageBridge service along with a personal identification number (PIN) which identifies you on the system. From there you will have various options including selecting which language you need. Then the magic starts. In just a few moments, a telephone interpreter will join you on the line. If you need to make a three way call, for instance to make a booking at an overseas hotel, the telephone interpreter can dial the third party and conference them in. We can also make international conference calls with whole groups of people speaking other languages. We offer two types of LanguageBridge telephone interpretation services. Our on-demand service is usually available 24/7 and requires no notice – we aim to have you connected to a telephone interpreter in less than one minute. The telephone interpreter you are connected to will not normally have specialist knowledge which makes this type of service suitable for ad hoc general language support applications, such as helping with booking travel tickets or general business conversation. Due to the general nature of the material covered and the ad hoc nature of the service, background material is not required. Simply pick up the phone and dial in – at any time. Where you need to be connected to a telephone interpreter with a higher level of subject matter expertise or in-depth knowledge, dedicated, trained interpreters can be assigned to your account. Typical applications for bespoke solutions include disaster recovery planning in the Oil and Gas Industry or complex company mergers and acquisitions meetings. In the case of bespoke teams, the same background material requirements as with other forms of interpreting apply – the better briefed the interpreter the better they are able to serve you. Most telephone interpreting is carried out in this mode which is sometimes also known as ‘listen before talk’. The best way to think about it is as a three-way conference call with you, the person you wish to speak to in a foreign language and your telephone interpreter. After speaking, you pause to allow your interpreter repeat what you have said in the foreign language and then wait for a response from the foreign participator. The main advantage of consecutive telephone interpreting is that it does not require any specialist equipment. All you need is a phone. This is a more specialised type of telephone interpreting which is usually used for one-way, broadcast type applications. For instance, if a company CEO wishes to make a live announcement to employees in different countries, a conference call can be set up where staff dial in and are able to listen in their own language. Simultaneous telephone interpreting requires careful planning and the use of specialist equipment. There are many options which we can discuss when you call. For simple on-demand use, no planning is required, simply pick up the phone and dial. 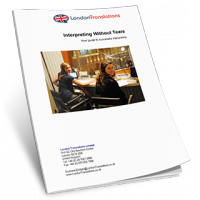 For larger calls or where simultaneous interpreting with specialist knowledge is required, the same level of planning as with on-site interpreters is required. We’re here to help. Simply give us a call and we’ll provide you with the best service for your needs.